Yep! I'm still in Papeete. Maybe you didn't expect a letter quite so soon, but there is a boat stopping here, bound for the States, June 5th, and as I am still here, I better get a letter on it. As yet I don't know just where or when I really begin my work. 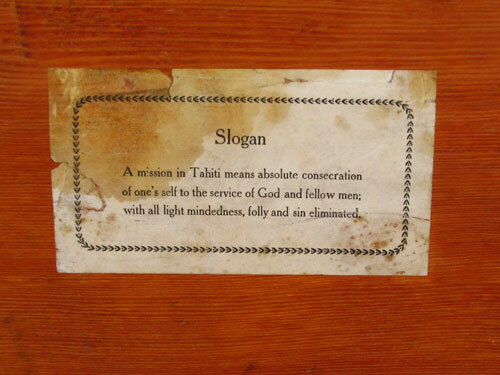 Two Elders have been called in from the Island of Tuboi, and they are to stop here, pick up two of us, and then go on up into the Tuamotu Islands. I only hope I am one of the two. From all reports, that group of Islands is the best; more of them. Let's hope for the best. By the time you receive this, I probably will be settled somewhere. I, as yet, haven't heard a word from anyone at home, and don't expect to until the boat that is due here on the 24th of July gets here. There then will be one going from here back to the States on the 25th of July (somewhere thereabouts.) After this letter, you needn't expect another until August sometime; sorry, it just can't be helped. Dean Palmer and Ben Winkel (ask Ernie if he knows him) will be returning on that boat. Dean is the acting Pres. here now. I have asked him to stop in and see you on his way through; he lives in Preston. If he can arrange it, and if everything goes as expected, he will be there sometime the early part of August. Mom, don't bother about the canvas shoes; I can buy them cheaper here. Everything is cheaper here. I bought a pair of sandals just for everyday wear around the house. They cost 45 francs or about $1.25. They will outlast two pair of canvas shoes. The language is still very dense to me. However, I do say a few words. I can ask "How are you", "What is your name", "I am feeling fine", "Good Morning", "Are you well?" etc. I have quite a large vocabulary of single words also. Each day we pick up two to five or six words that we try to remember. Have learned one complete song and can sing three others with the help of words. Each nite (nearly every night) a group of young people come over and we sit out on the back porch. They get us to repeat words after them and touch their eyes, nose, etc. and we tell them what they are. Then we also get in plenty of singing. I really do like it here. The food is very good. I have yet to find something I don't like. I have drank only a quarter of a cup of coconut milk, and only had fish for one meal. I guess all that will come later. Poi , the way our cook prepares it, is very good. My weight today was 155 lbs. To date I have eaten 114 bananas. That includes up to tonight. It's sort of interesting keeping track. I slowed up for a few days; had to wait until a couple of stalks ripened. In all I have eaten almost ten cents worth. Wish you had some of them. We can't eat them as fast as they ripen once a stalk starts to ripen. For the past few mornings we have had a little work to do... for a change. We had to fold papers and printed pages for song books. We will be busy doing that every morning for a week now. (I just learned that it might be two weeks more before we go out.... one of us might go next week... just whenever the Elders that are coming in can get a boat.) After every meal one of the three of us has to help with the dishes; still can't get away from that. In the afternoons we usually have an hour Grammar lesson. This helps build a vocabulary, and also helps on our accents. The Language consists nearly wholely on accents. The camphor box 70 years later. It still smells of camphor. Last Sunday I gave my first speech in Sacrament meeting. In S.S. I had to close with prayer. My first words were "E te Atua te Metua mure ore ;" I actually started off that way! My first time before the public. It means "O God the Eternal Father." Then I went on giving the rest of the prayer in English, and closed with Tahitian "Amene ". It took about all the nerve I had to stand before an audience for the first time and say a few words in their Native tongue, and yet, these people are easy to talk to. My speech in Sac. meeting only lasted about three minutes, but that was about all the time alloted each of us. I was first in that too. Starting off pretty good, eh? I have the distinction of being the youngest and yet tallest Elder in the Tahitian Mission. (Among the Missionarys; I am three months younger than the next one. Makes me feel young. Ray is the next youngest. 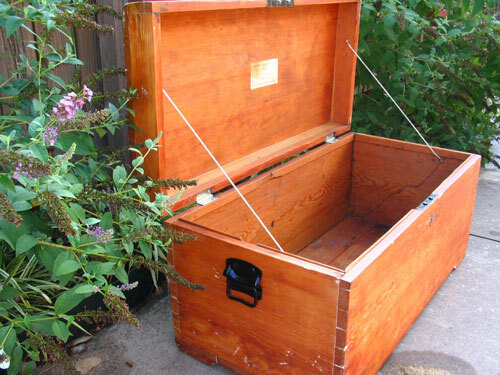 While traveling to Islands we use a "Camphor Box", and don't use our trunks or suitcases at all. I bought a box large enough to pack all the clothes that I will take out to last me 6 months or more; it may be longer than that before I come in again. The box cost me 85 F. (I find it easier to deal in francs than dollars. When you see me write F just figure franc. Francs are worth 36 F to the $1.00... a very good exchange... ask someone who knows.) Anyway my box cost 85 F. It is what I shall use to pack things home in also. All the Elders have them. I also have a smaller one for books. It was left by one of the Elders that returned recently. I got it quite cheap. I have just about all I need now except a Bible (Tahitian), pillow, a little medicine, and a few minor things. Our police tax will cost only $15. That is what the franc standing does for us. I am keeping a close record on all that I spend, so in about 30 months we, Mother, Dad, & I, will go over it just for fun. Today I took a few pictures. If possible I will get them in this letter, but I don't get them back from developer until tomorrow, so I won't have much time to print them. If I can mail this letter Sunday morning so that it will catch the boat Sunday afternoon I will have them in it. These few are the ones I took since I left home; I can't send many... they weigh too much. Postage is 5¢ on 20 grams and 10¢ on all over up to 40 grams and then higher. This already will weigh close to 40. I'll send a few each letter though. I also am sending a few to Barbara. I'll tell her in her letter to give them to you after she has seen them. You be sure to save them so I may put them in my album when I get home, O.K??? Well, I guess that is about all for this time. You know I am still thrilled with this Mission and anxious to get into my work, as soon as I can get the language. All in all I hope no longer than seven months. That is flattering myself, I'm afraid it might take nine months. Write to a fellow often all of you. When I do receive a letter there should be lots of them. Remember, I haven't heard a word yet and won't until last of July or August & maybe not until Sept.
Love from someone who loves you all, Dean.